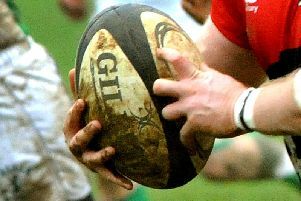 Olney humbled league leaders Oadby Wyggestonian in a 25-17 thriller. It took just eight minutes for Olney to take the lead on home soil, having driven a scrum up to the Wyggs line before prop Jeremiah Shields touched down for a try. Kieran Manson added the conversion to put Olney 7-0 up. From the restart Olney counter attacked and were awarded a penalty for offside. Wygg's were also reduced to fourteen men, their No. 8 yellow carded for stamping. The kick to touch gave Olney a lineout inside the visitor's '22'. Winning the ball the home eight drove for the goal line and lock Christian Caswell touched down for a try for 12-0. Olney's dominance of the scoreboard came on 34 minutes, from the forwards winning a line out on their 10m line. They drove the maul and when the ball went loose, Wyggs cleared to the touch line inside the visitor's 22. Olney won the lineout and the forwards put flanker Isaac Shields in for a try as the home side opened up a 17-0 lead. As half time approached the visitors upped their game and claimed more possession, Olney lost some discipline and conceded some penalties. They managed to prevent the visitors scoring until the last play of the half. Wyggs took the scrum option at consecutive penalties close to Olney's goal line. Finally they put Arthur Redfern in for a try, Jack Elliott added the conversion. Olney kicked off for the second half, Wyggs having put a bit more bulk into the side with their substitutions. The game plan was much the same for both sides, though Olney did try to run the ball in the backs. It was 10minutes into the half when Wyggs broke the Olney defence. They scored through the same duo Redfern - try, Elliott - conversion to reduce the score to 17-14. The sides exchanged penalty kicks before Olney George Stanton ran in a late try to secure the win for Olney.